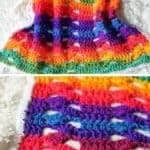 This crochet rainbow baby blanket is an easy beginner friendly project while at the same time has the look of something that took much longer to make! 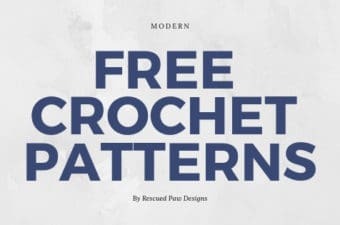 This design is worked up using a one row repeat and is super simple to crochet. 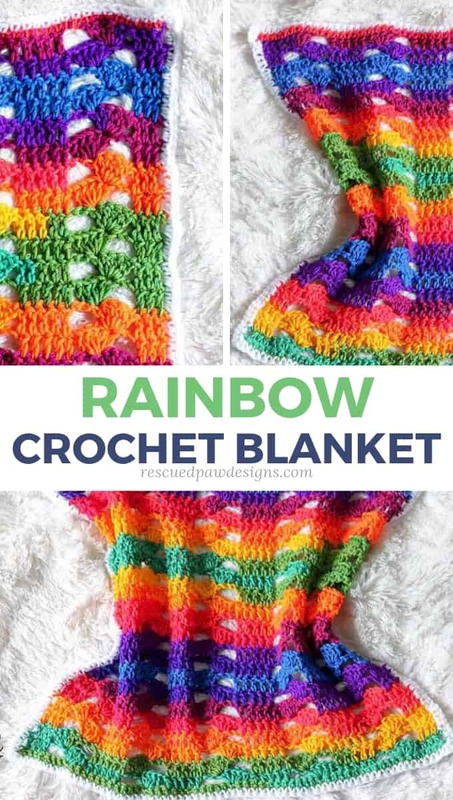 If you are ready to make your very own rainbow crochet blanket then read on down to find the free crochet pattern! BRIGHT YARN COLORS ARE FUN! 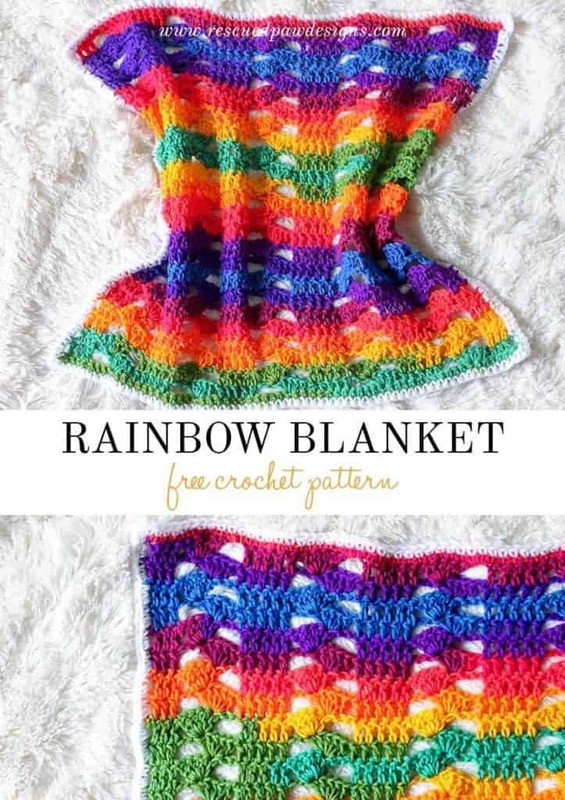 The yarn that is perfect for this rainbow crochet blanket! I used Red Heart Super Saver Stripes so I could get the look of stripes without all the color changes and let’s not forget weaving in ends! Yuck! 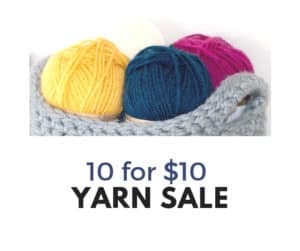 If rainbow stripes aren’t for you then no worries this yarn comes in some great color varieties so there is something you will love! Check out all the choices on the Red Heart Yarns website or even on Amazon. Just look at the picture below to see how smoothly the colors blend together! I can’t wait to see how your blanket turns out. 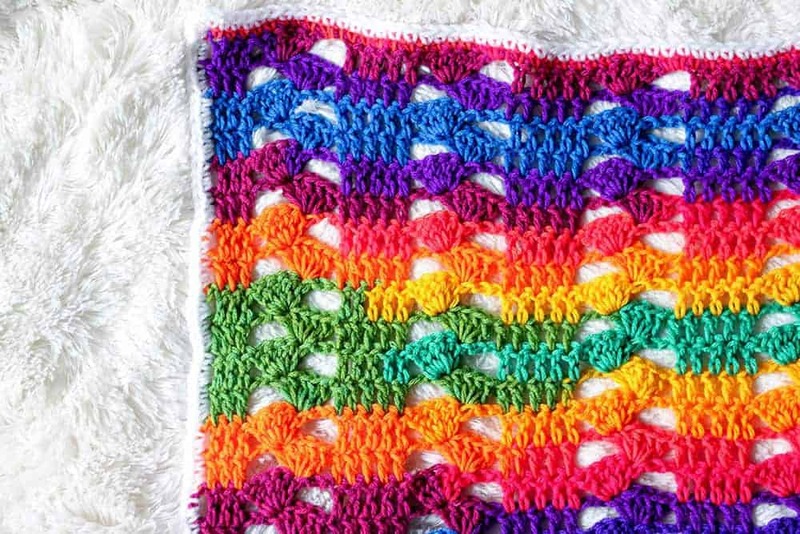 This colorful blanket uses only 1 skien of yarn! If you think this stitch looks complicated then you are mistaken because it is beginner friendly and works up fast! Promise. 🙂 This blanket is made up of entirely double crochets! If you need a refresher on how a double crochet is worked up then click on over to my beginner tutorial “here“. I worked this up in less than a day by picking it up in between taking care of the kids, laundry and house chores. If I can do it so can you! Also, if you’d like to make a different size the directions are below on how to change the starting chain. Easy Peasy! 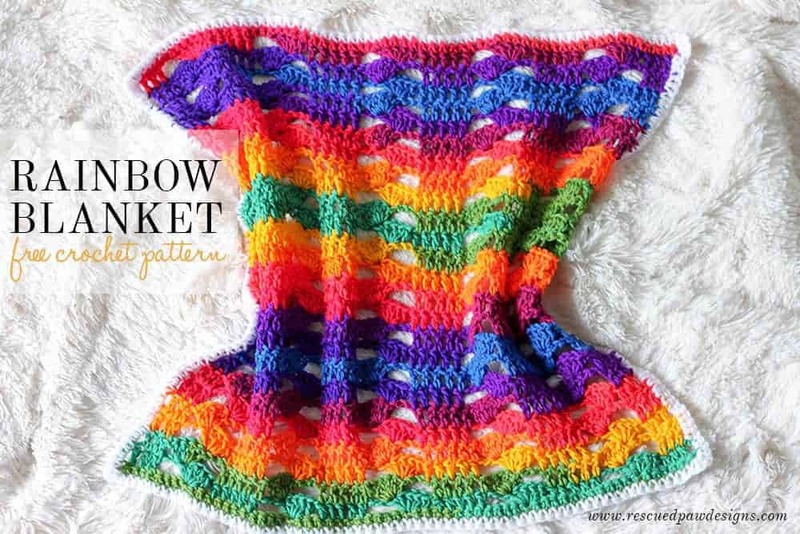 Ready to get started on the rainbow baby blanket crochet pattern? 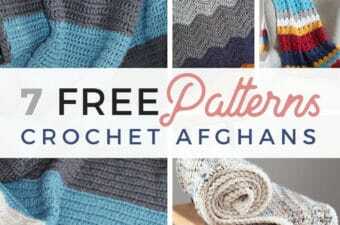 Scroll on down for the pattern or add to Ravelry to make later or purchase a PDF for $2.99 “here“. 276 Yards of Red Heart Super Saver Stripes Yarn or any worsted weight 4 yarn. CH 3 (Counts as first DC), SK first ST, 1 DC in each of next 3 ST’s, *SK next 2 ST’s, 5 DC’s in next ST, CH 2, SK next 4 ST’s, 1 DC in each of next 5 ST’s, Repeat from * across ending last repeat with 1 DC in each of the last 4 ST’s, turn. CH 3 (counts as the first DC), SK 1 ST, 1 DC in each of next 3 ST’s, * SK CH 2 space and work 5 DC’s into 1st DC of cluster from row before, CH 2, SK the next 4 ST’s of the cluster, Work 1 DC into next 5 DC’s from previous row, Repeat from * across ending last repeat with 1 DC in each of of the next 3 DC’s from the previous row, 1 DC in top of the the turning CH, turn. Row Ch 1, Sc in every ST across. 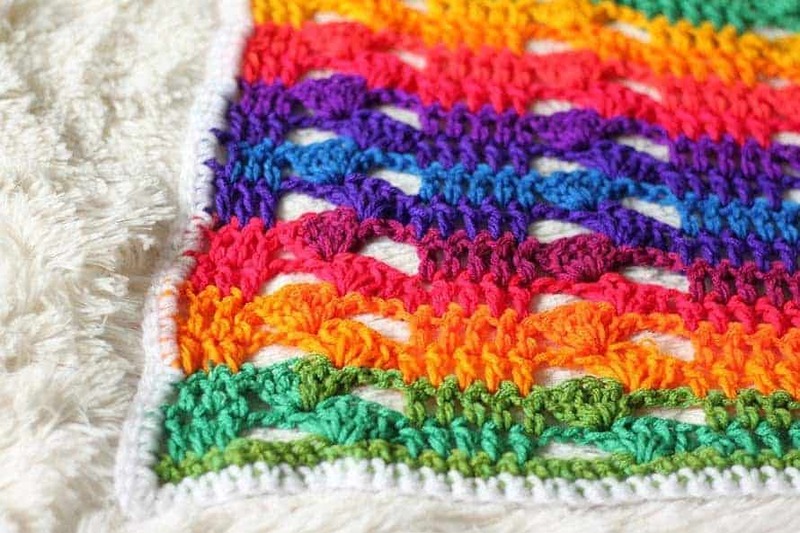 Attach white yarn to your rainbow cluster blanket after the last row, starting in first ST down the long side SC, make 74 SC’s evenly along the side next do 2 SC’s CH 1 2 SCs in the corner, continue working along bottom short side of blanket doing 61 SC’s until you reach the next corner, do 2 SC CH 1, 2 SC, continue working your way around the blanket in the same manner until you reach the last corner. After working your way around the blanket fasten off your yarn and weave in the loose ends with a yarn needle. The Rainbow Cluster Blanket is now finished! Did you like this simple pattern? 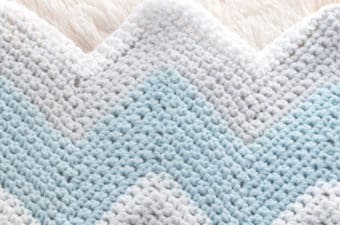 You may also like our free patterns for the Chevron Crochet Blanket, Charlotte Crochet Blanket and many more found in our crochet blanket section. 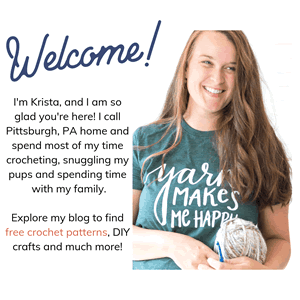 Use the form below to sign up for my free weekly newsletter to get crochet patterns directly into your inbox!